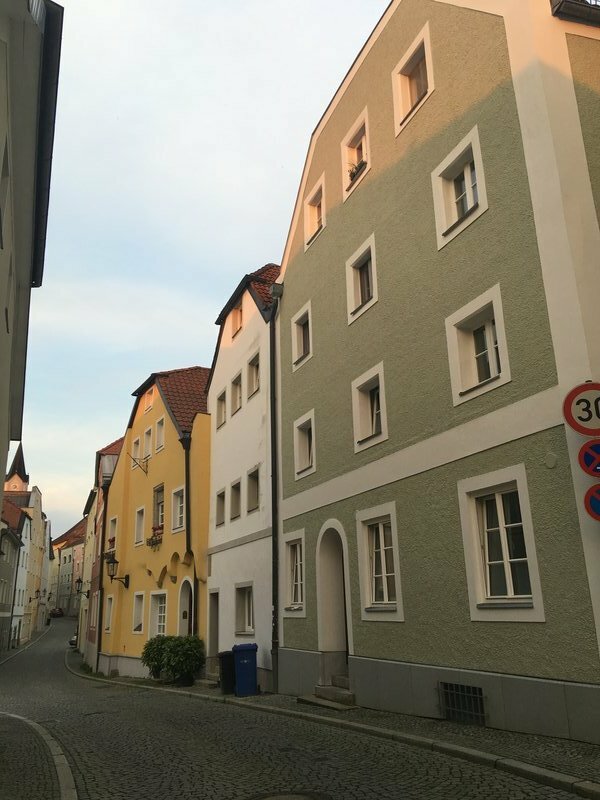 When planning our trip I'd debated whether to stop for a night in Passau or Regensburg on the way back to Munich from Prague. At some point I realized I had an extra day in the itinerary due to having forgotten that there were 31 days in July, so we were able to visit both. 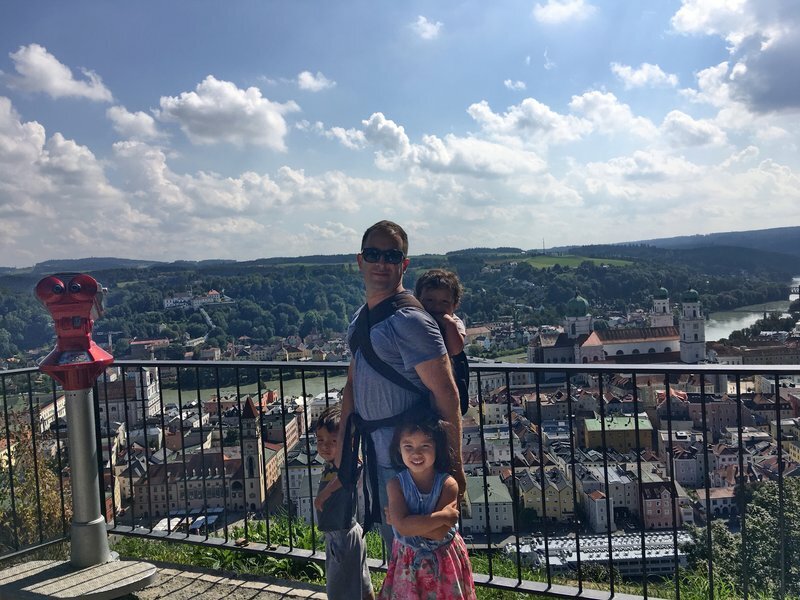 I probably would have chosen Regensburg, the larger and more well-known of the two, but Passau proved to be a wonderful and unique city that would have been a shame to miss. That extra day proved to be very fortunate. As with Český Krumlov, the unique character of Passau is made possible by the interaction of land and water. The Danube and Inn rivers converge obliquely to form a narrow tongue of land which contains the Old Town. At the northern bank of the river opposite the convergence point, the smaller Ilz river empties into the Danube as well. 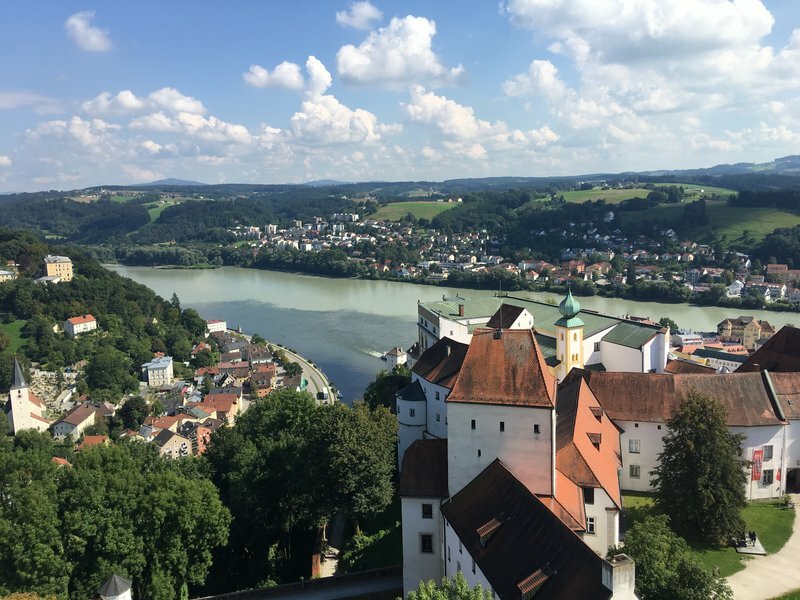 Overlooking this confluence is the Veste Oberhaus, a medieval hilltop fortress on the northern bank. 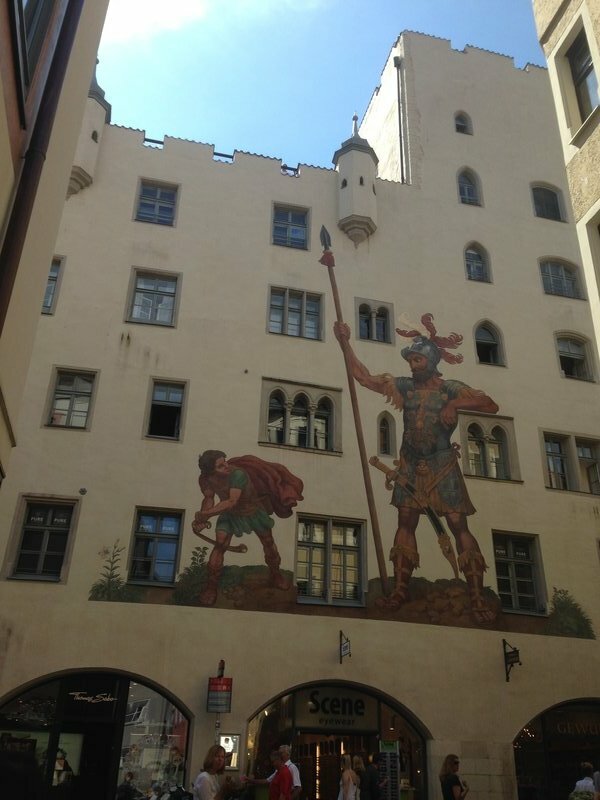 Our Airbnb was on Lederergasse, a narrow cobblestone street on the southern bank of the Inn. The winding street was lined with immaculate and colorful houses with stucco facades. As usual, there wasn't much time to do more than check in and get dinner. 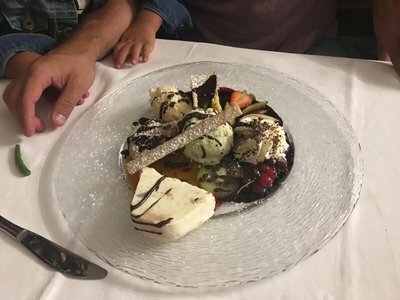 We got a very good meal downtown with some delicious desserts to reward the kids for not being too horrible on the drive from Czechia. 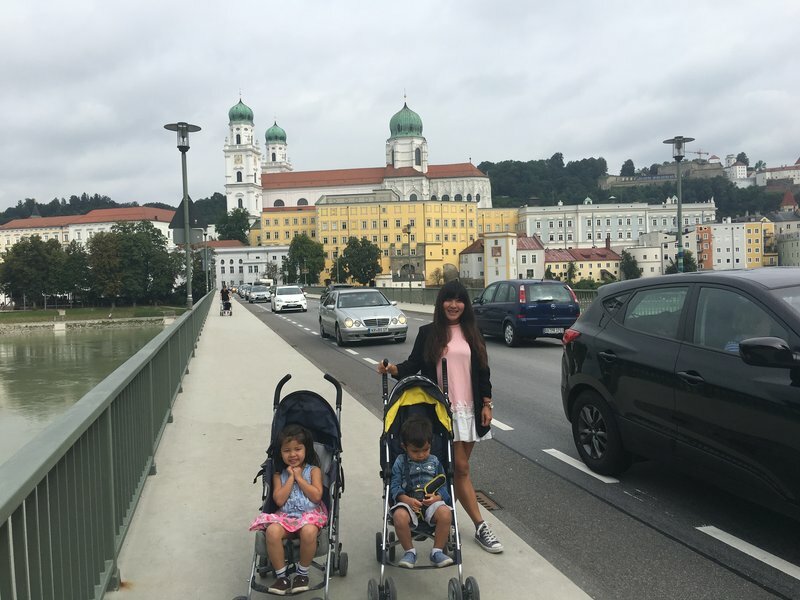 We only had half a day to explore Passau, so we got an early start Friday morning. 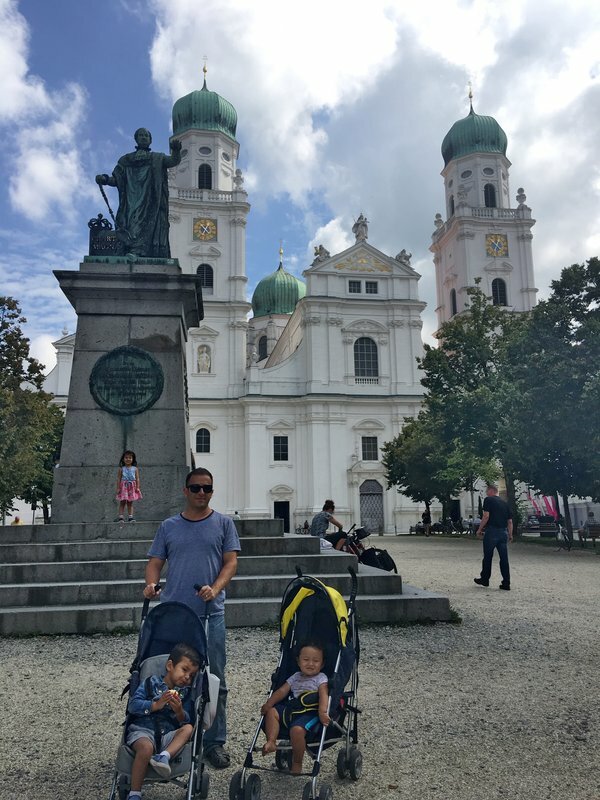 The main landmark of the Old Town is St. Stephan's Cathedral, which looked close as we crossed the Inn over the Mariahilfstrasse bridge but actually could only be reached via a long circuitous uphill route. 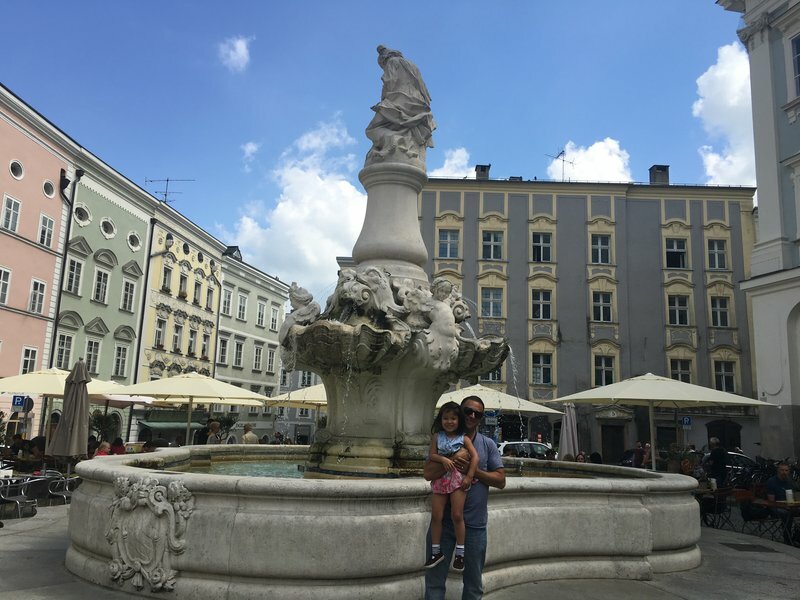 We walked eastward among beautiful Baroque fountains and townhouses to the tip of the Old Town, which finally ended in an attractive park mostly surrounded by water. Across the Danube, the Veste Oberhaus loomed above us. 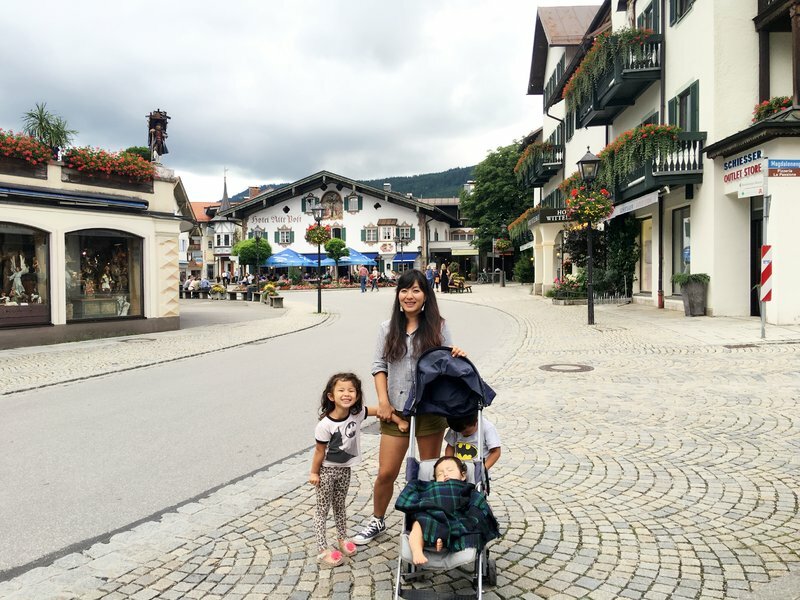 We took the easy way out and drove the SUV up to the Veste Oberhaus. 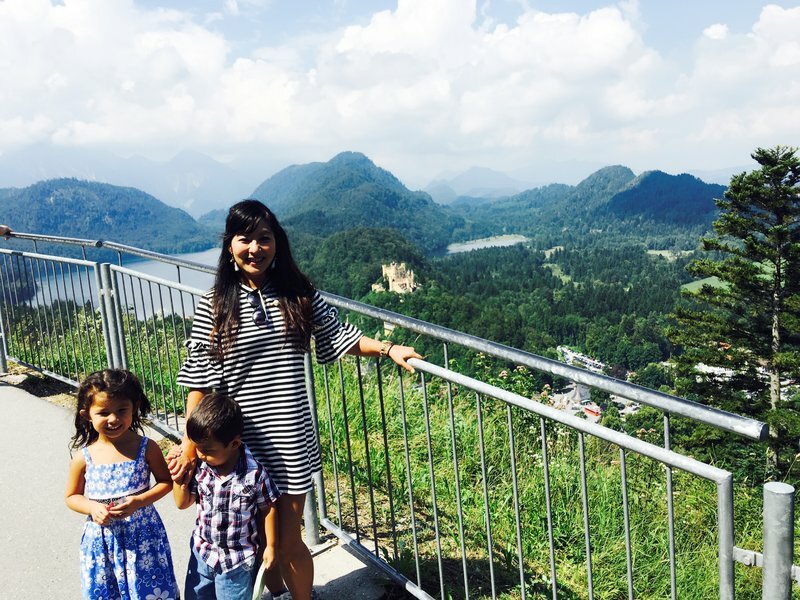 We climbed the observation tower for panoramic views of the idyllic countryside and the Danube. On ground level we got ice cream for the kids at the cafe, which also had a sandbox with a view. 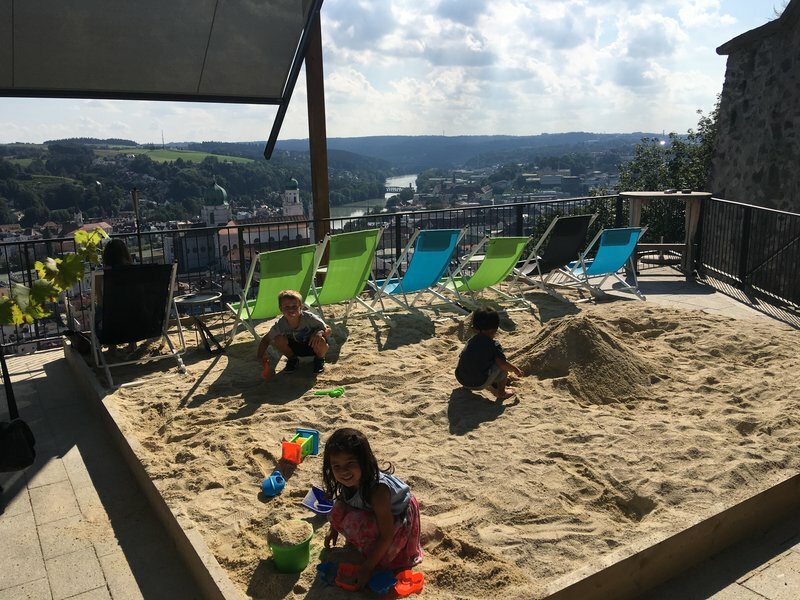 Here and here are more blogs with pictures and stories about Passau. 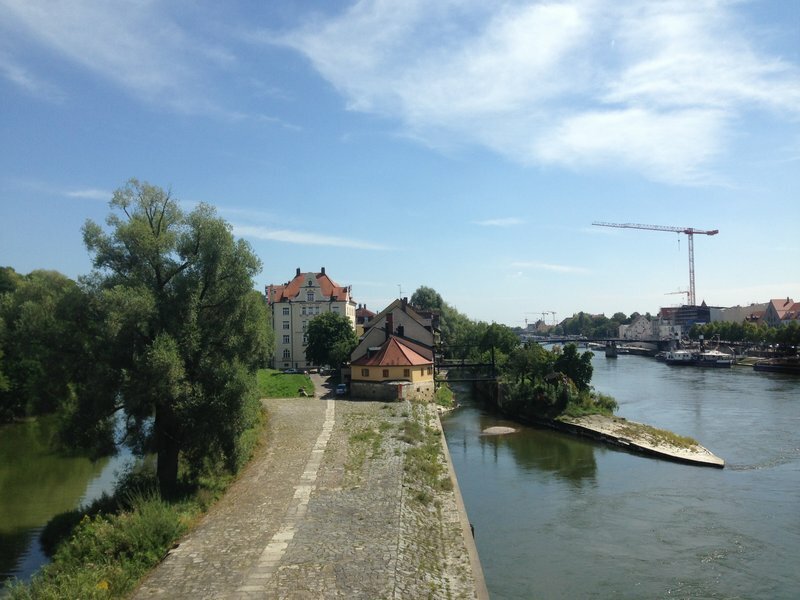 We encountered the Danube once again in Regensburg, our last city of the trip. 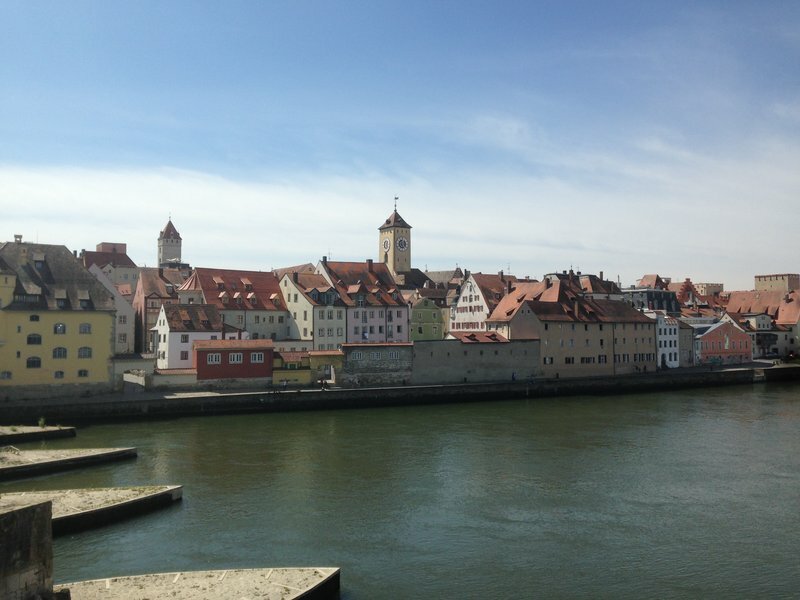 The Old Town of Regensburg wasn't as storybook perfect as Passau had been, but there was still a lot to see. 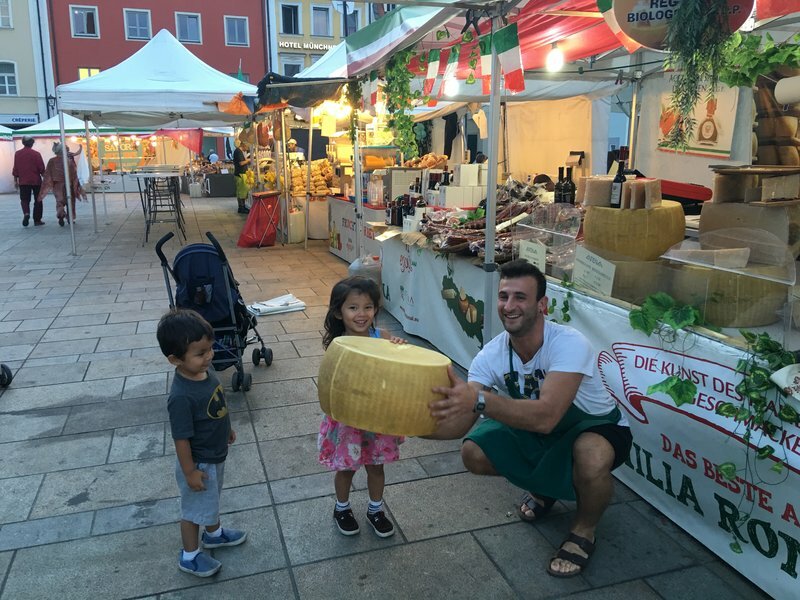 We found an Italian food festival in the main square before having dinner in the shadow of Regensburg's enormous Gothic cathedral. 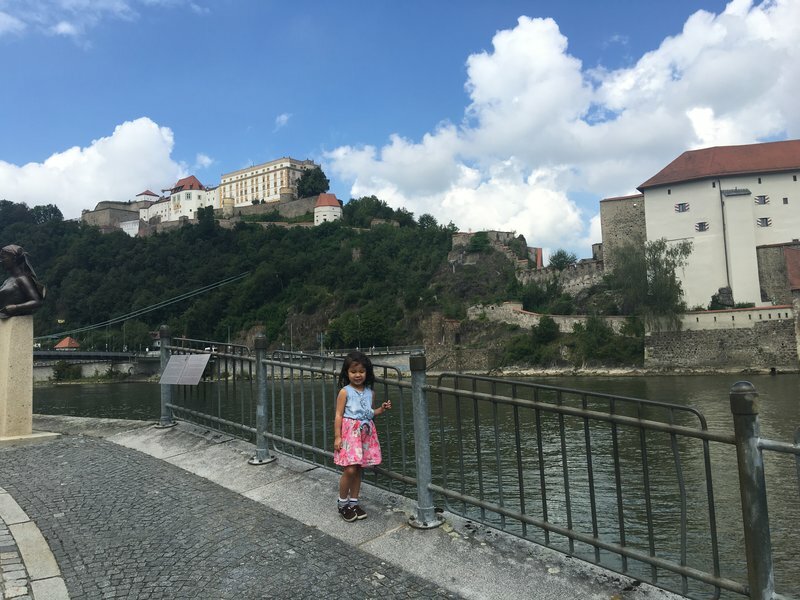 On Saturday morning we drove to the southern bank of the Danube in the Old Town to hunt for the weekly market, the Donaumarkt, but were unable to find either the market or anyone who seemed to know what we were talking about. Perhaps it doesn't take place every Saturday, or perhaps we were in the wrong place. Instead we settled for some views from the Stone Bridge and a sausage breakfast before leaving town. 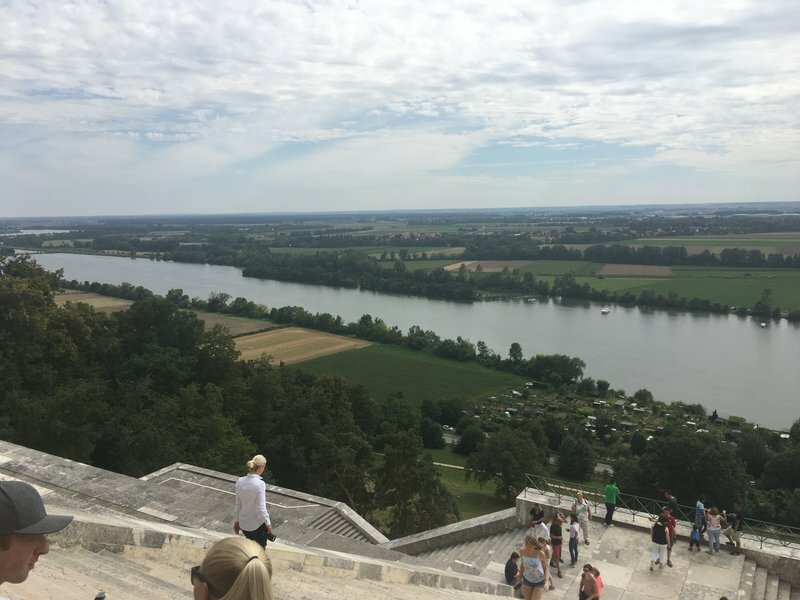 Our last stop before returning to Munich was an unusual building called Walhalla on the bank of the Danube, about 15 minutes downstream from Regensburg. The monument was constructed in the 19th century to honor German cultural heroes throughout the centuries. Some might regard it as an architectural monstrosity, but I found it very serene and we were glad to have some final views over the amazing Danube. 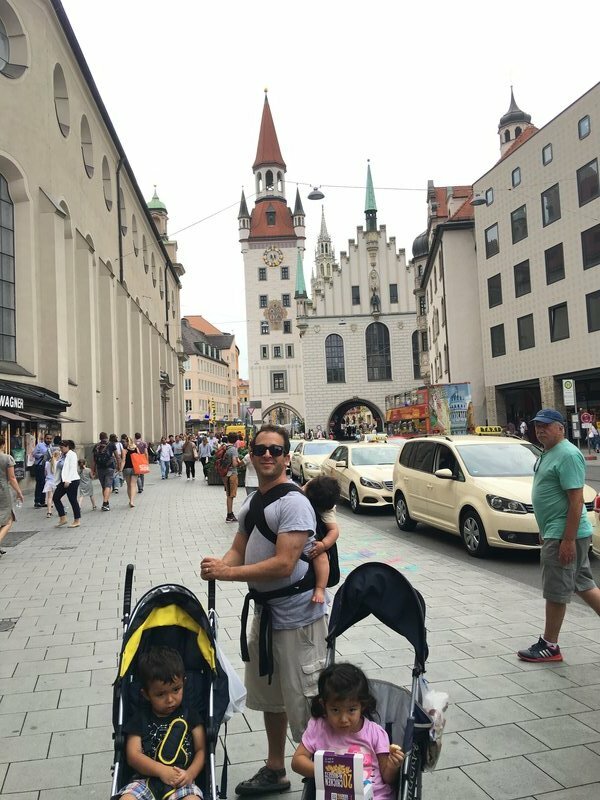 We had booked a hotel near the airport for our early morning flight back to Miami, so we decided to spend our last few hours in Munich. Naturally we made a beeline for the Hirschgarten where we braved a steady drizzle to gorge on currywurst and Steckerlfisch one last time. The rain ruled out the playground so we sorrowfully got back in the SUV and prepared to endure another months-long exile from our favorite continent. 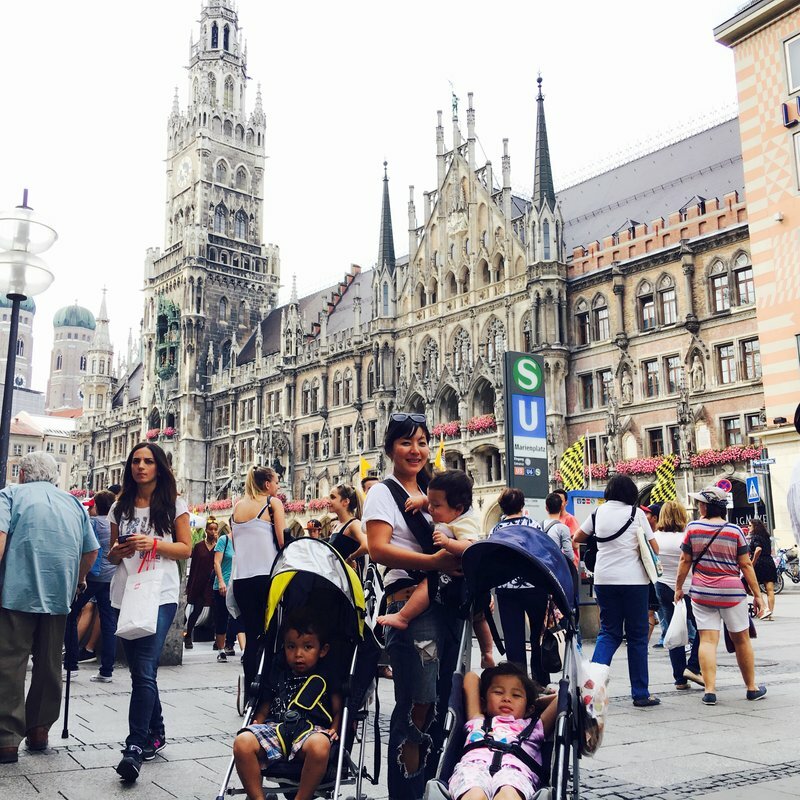 Munich had been a huge success, and the food was much better than I'd remembered from my last visit to Germany, Nevertheless, we were eager to get on the open road and begin our discovery of Central Europe. There were so many legendary cities ahead of us. 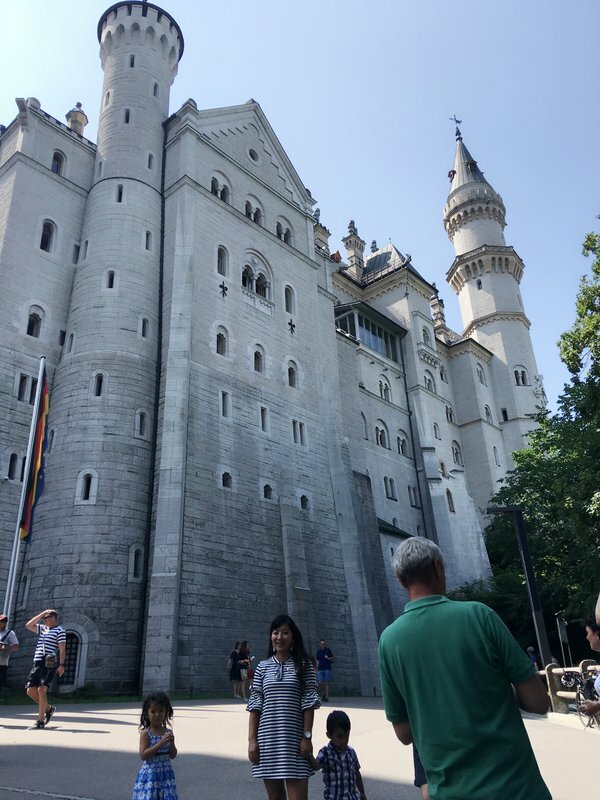 I had structured our itinerary to take us to some of the greatest castles of Europe, with the most famous of all being Neuschwanstein. Apparently the tickets to see the interior of the castle had to be bought hours in advance, so we decided we'd save that one for the following morning. 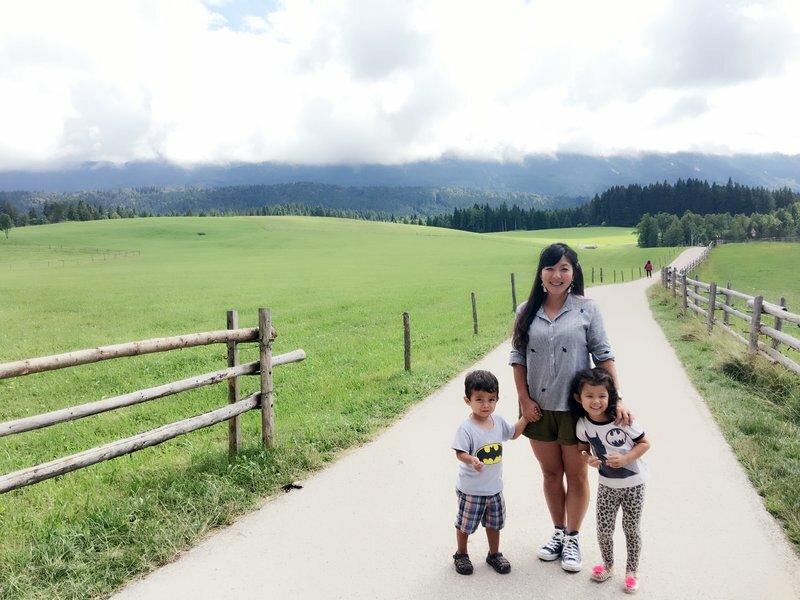 Soon after leaving Munich, we found ourselves winding through the beautiful Bavarian countryside. 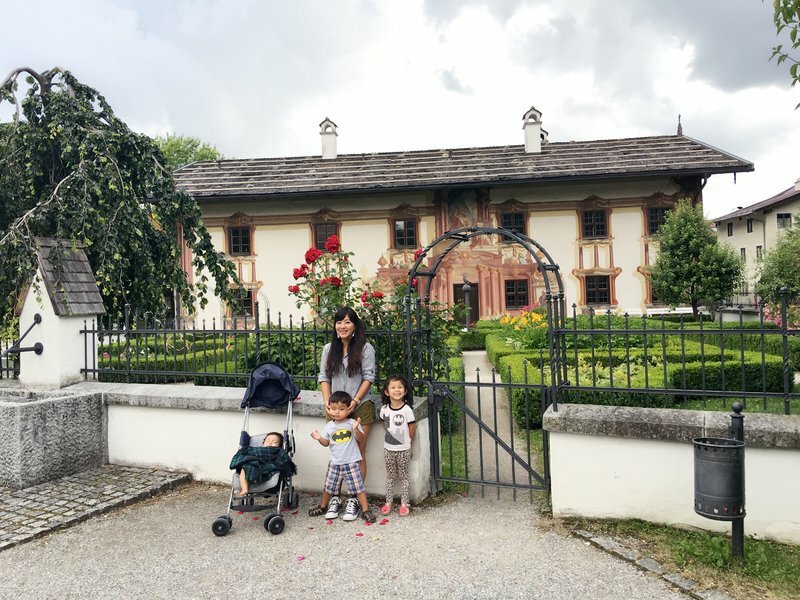 Our first stop on the road trip was the 18th century rococo style Wieskirche, which has been a destination for pilgrims since tears were seen on the face of a wooden figure of Jesus in 1738. 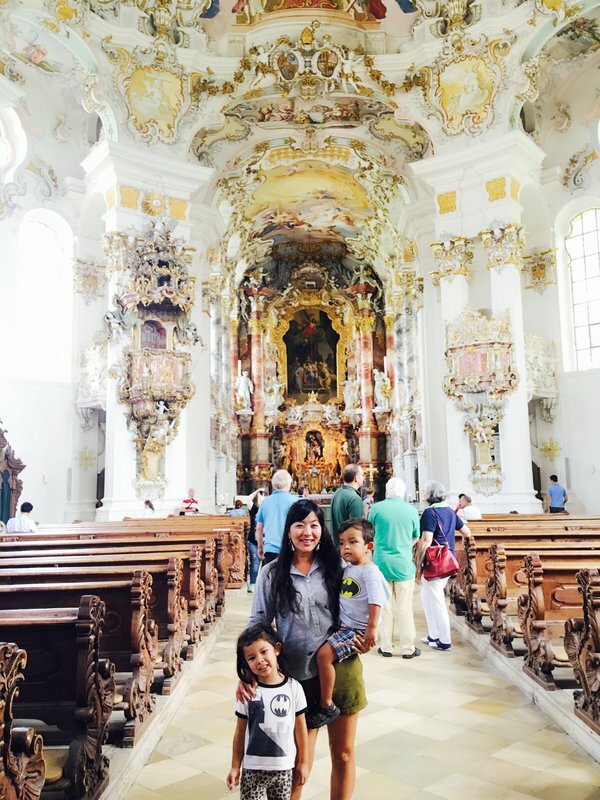 The church was surrounded by green pastures with patches of forest and the Ammergau Alps visible in the distance. 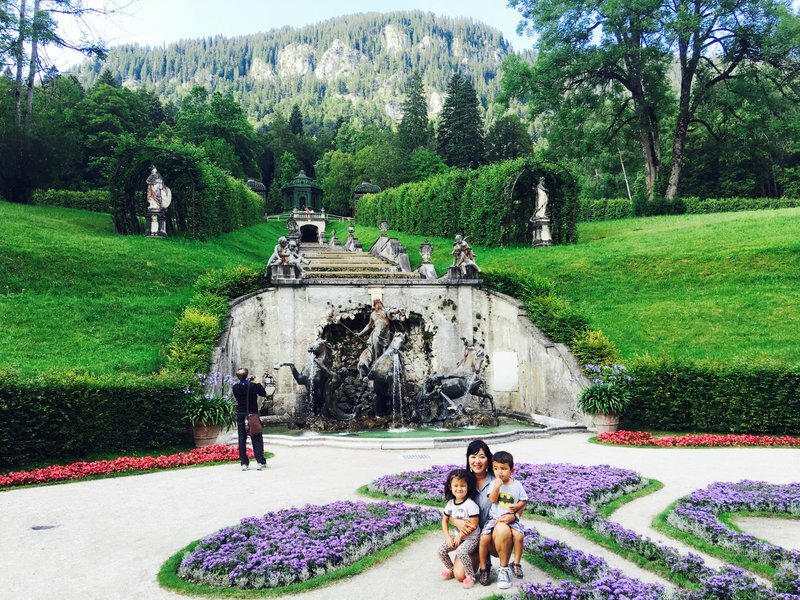 After a snack at Wieskirche, it was still relatively early so we decided to squeeze in Linderhof Palace that afternoon. 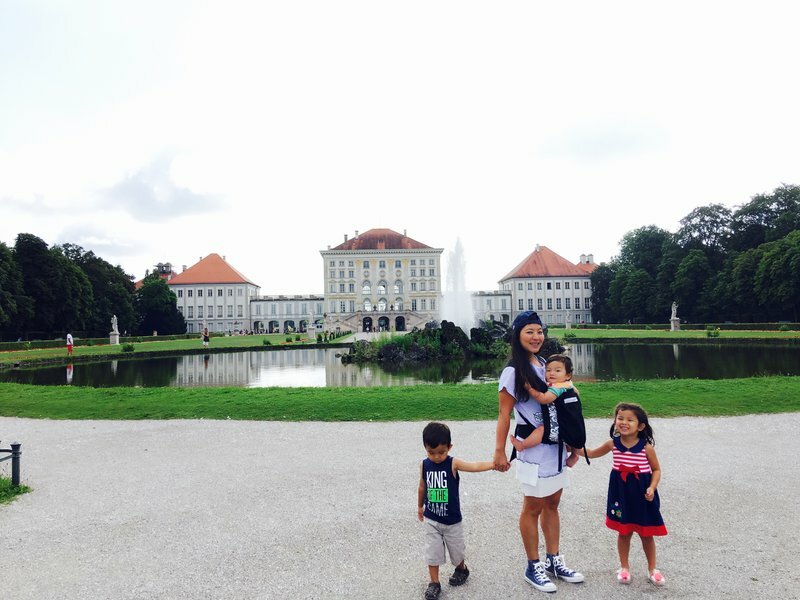 We spent quite a long time at this Versailles-inspired estate, between the extensive grounds and the main palace building. There was even an artificial grotto with a lake and a swan boat. 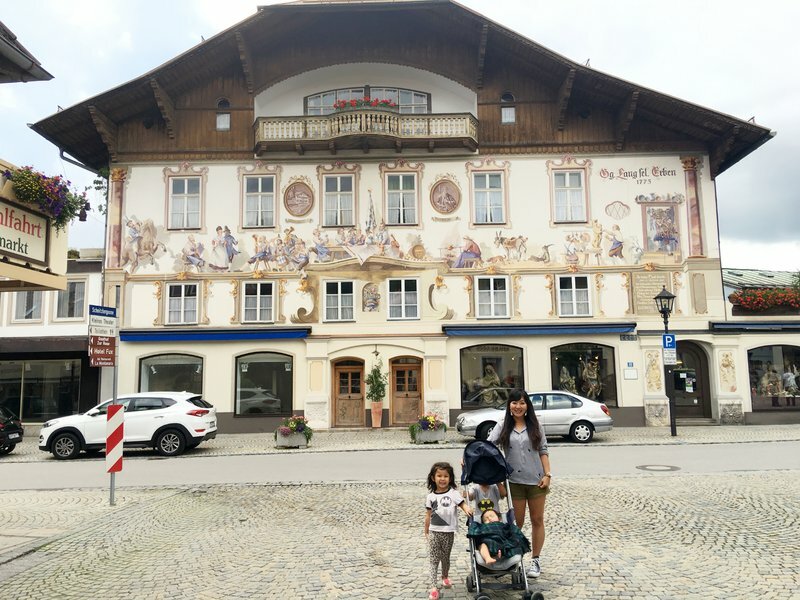 We decided to have dinner in nearby Oberammergau, famous for the fresco-covered houses called Lüftlmalerei. Some of the houses had been painted so that the flat walls looked to be festooned with Greek columns and elaborate balconies. After walking around the town we had an excellent dinner at a hotel restaurant we found on TripAdvisor. Our Airbnb hotel was over the Austrian border in Heiterwang. We still had to gas up the car and buy a highway vignette sticker for Austria, so it was very late by the time we finally bedded down. 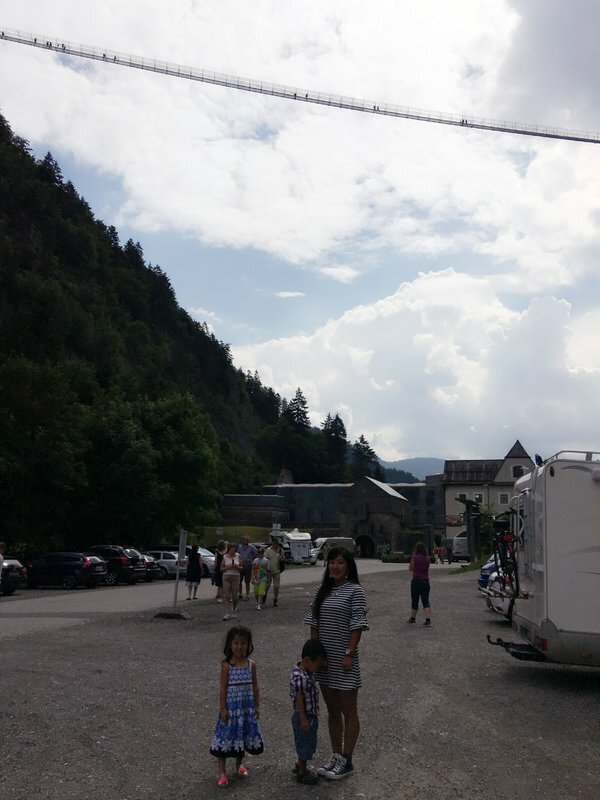 The hotel and setting reminded me a lot of our overnight stay in Andorra a few months earlier. 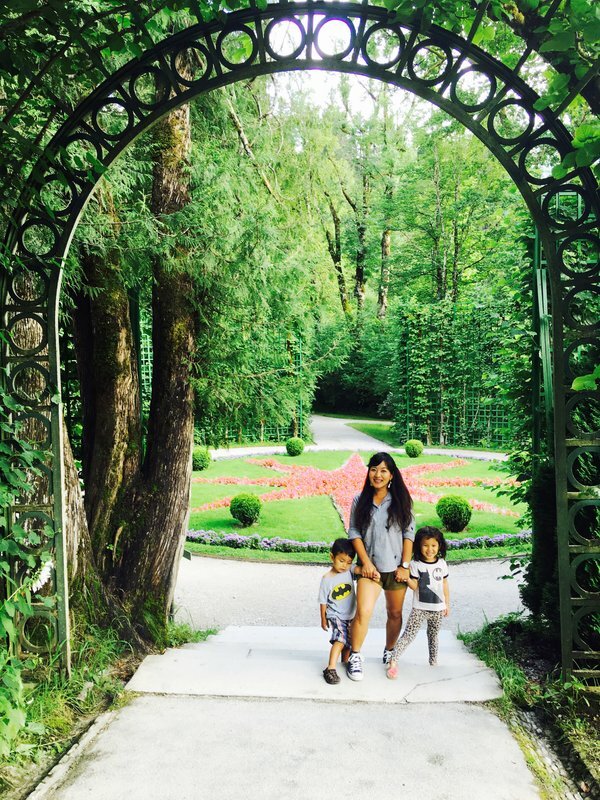 The next morning we took a few minutes to gaze at the mountainous surroundings before heading to Neuschwanstein. As usual when we most anticipate something on our travels, the destination can't live up to expectations. 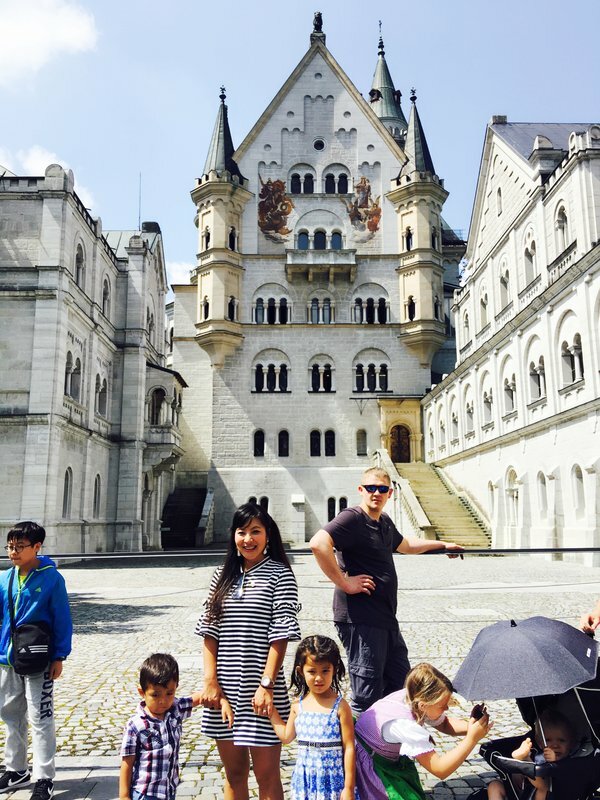 Neuschwanstein Castle looks amazing in pictures, but those are taken from helicopters or drones and never show the throngs of tourists that clog every path. We quickly ruled out the tour of the interior of the castle after we learned that there was a four hour wait before the next available space. The line for the horse carriage to the top of the hill seemed short, but a carriage only showed up every half hour. 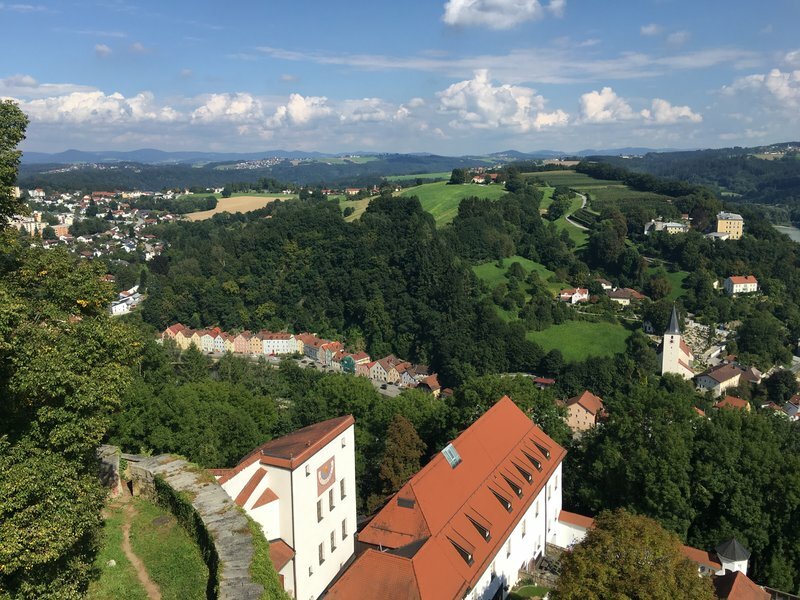 Once we reached the top, we found that the Marienbrücke which affords the best view of the castle was closed so we had to settle for pictures partially obstructed by trees and crowds of people. Despite these drawbacks, the sheer size and classical beauty of the castle made the visit more than worthwhile. After lunch we set off for Innsbruck. Back in Austria, I saw a ruined castle atop a tall hill from the highway. Something resembling a wire ran from the castle to the top of another tall hill on the other side of the highway. As we drew closer, I realized the wire was actually a suspension bridge running hundreds of feet above us. I could see tiny figures moving back and forth across the bridge. I knew this could be an amazing experience if it was possible for us to take the kids up there, so I pulled over and did some quick research on my phone. I learned that the bridge was called the Highline 179 and it had only been open for less than two years. We still had some time before the bridge closed for the day so we got our tickets and began the long hike to the top of the hill. 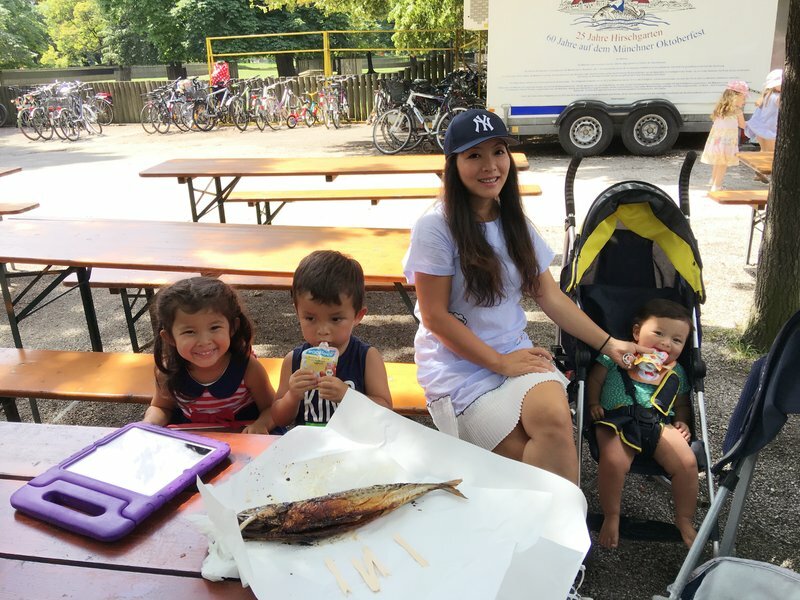 Mei Ling vetoed my plan to backpack both the younger kids and Ian did much better than I expected with the hike. 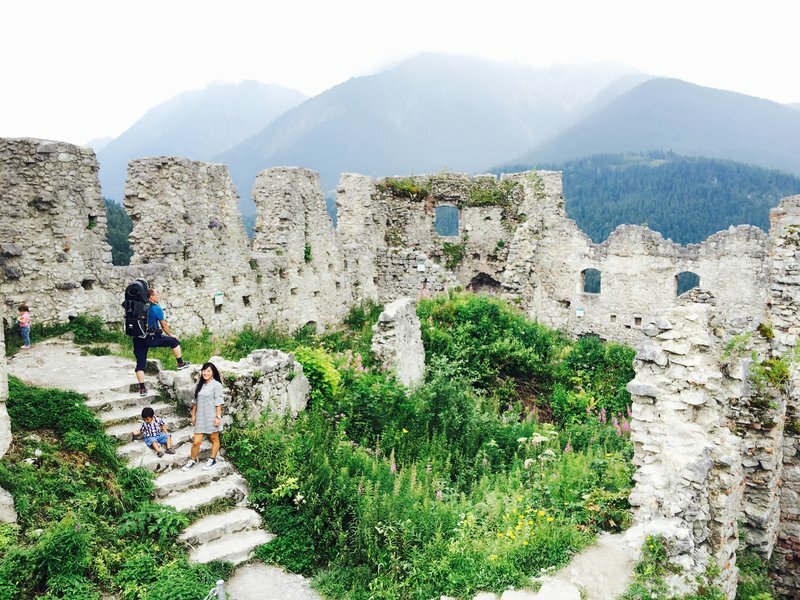 We eventually made it to the ruins, which were a lot of fun to explore and had great views. 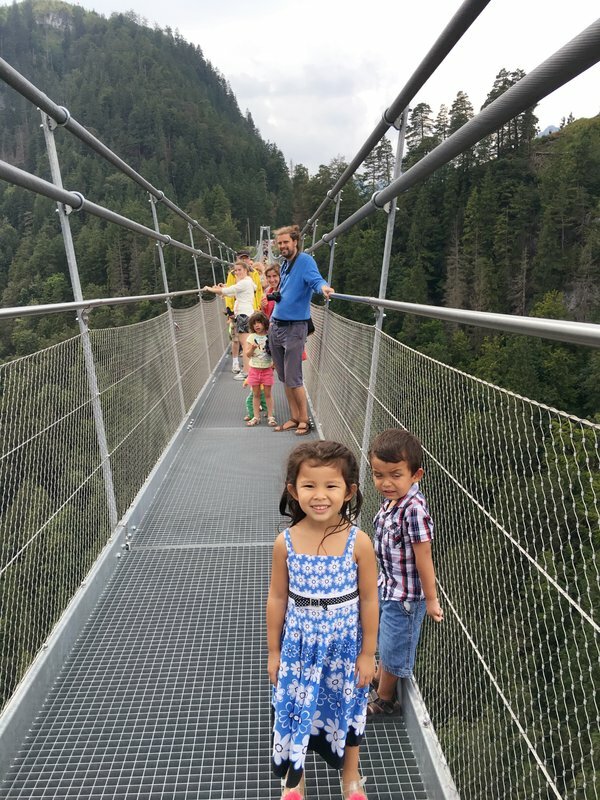 Mei Ling couldn't stand to be on the suspension bridge for more than a few seconds, so I took the kids halfway across. The sight of the parking lot 350 feet below us didn't seem to bother them one bit. We hurried back down the hill to the parking lot. We were going to be late for dinner in Innsbruck. My first experience with Munich was back in 1994. 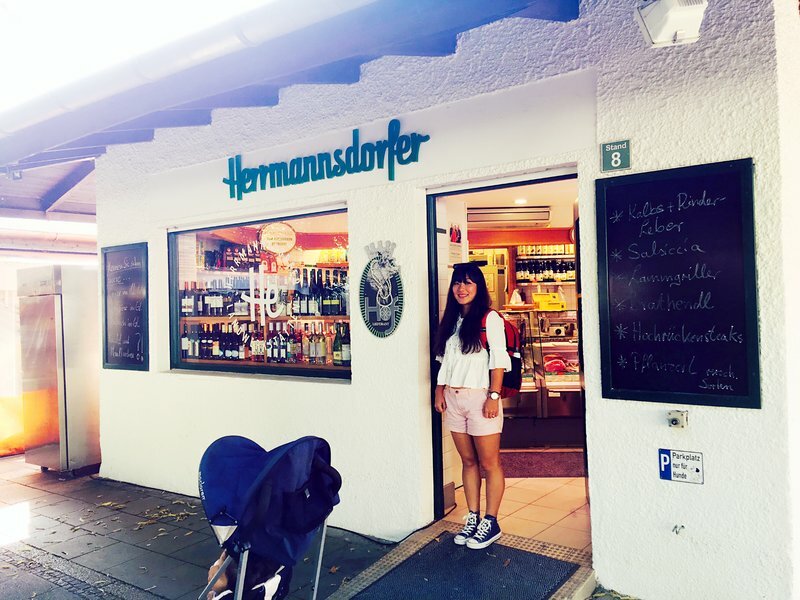 I'd met a number of German medical students during a brief neurology externship in London, and decided to visit a few of them on a three week rail tour of Germany. 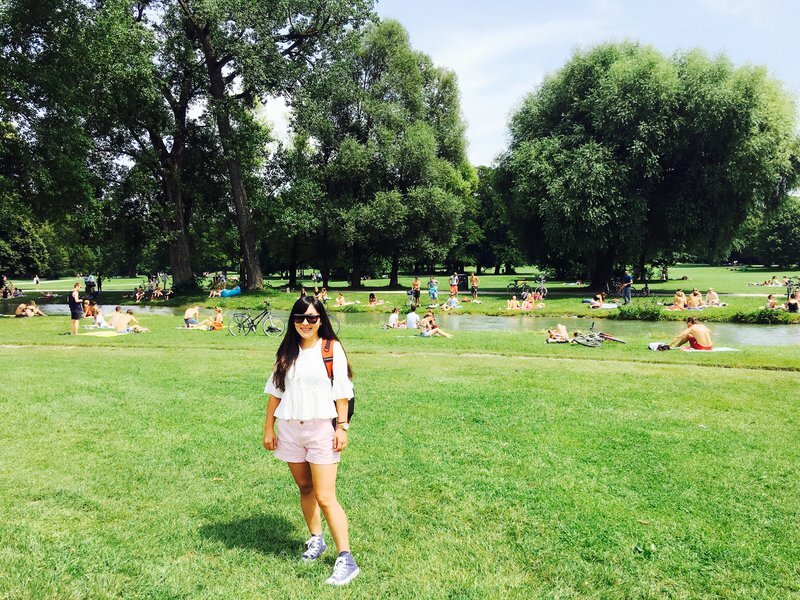 I stayed in my friend's apartment in Munich's Olympic Village and we rode bikes to the Englischer Garten where we did a tour of the beer gardens, consuming a one liter mass bier in each and hopping back on our bikes. After the third or fourth I became separated from my friend and found myself unable to keep the bike straight on the path. I wobbled along at a snail's pace and ultimately fell over completely to the side. I staggered to a bench and put my head down in my hands until it stopped swimming. When I finally raised my head and opened my eyes, all the people near me were naked. I'd never hallucinated after excessive beer consumption before, so I soon realized that I'd stumbled into a nudist area. It was the culmination of a very disorienting morning, and essentially my only solid memory of Munich. More than twenty years later, I was looking forward to reacquainting myself with the city in a more sophisticated way. After our usual overnight flight to Europe, we started out by picking up our rental car and our local SIM. I had thought I was renting another minivan, and got a shock when our car turned out to be a two row SUV. There were two flip up seats in the trunk but that wouldn't leave enough space for the bags. I was getting ready to go ballistic when I realized that the rear seat was probably wide enough to accommodate all three car seats. We set them all up and amazingly they fit. We had plenty of room in the trunk for our bags as well, especially since we'd brought two individual strollers instead of the gondola. After the stress of navigating the giant Iceberg around France in the spring, the SUV was a welcome change. The only drawback was that now the kids were close enough to touch and annoy each other. We had a pleasant surprise with the Vodafone SIM as well. Whereas just a few months ago I'd had to buy separate SIMs in each European country, there was now a data plan that covered pretty much the whole EU. That would save me a lot of time and hassle considering that we would be crossing six countries during the trip. Next stop was our Airbnb, which was perfectly adequate except for being a fourth floor walk-up. I find those staircases a lot less objectionable when I'm making a reservation than when I actually have to climb them. Since we only had three days in Munich and we wanted to get aligned with the time change, we proceeded directly to our highest priority destination, the Viktualienmarkt. 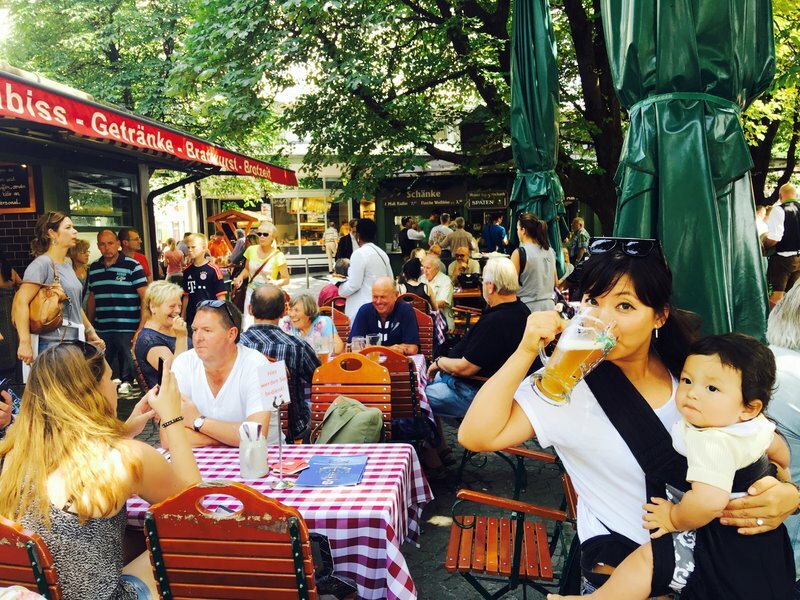 This is the most central market in Munich, with a reputation for offering the best quality produce and gourmet specialties. 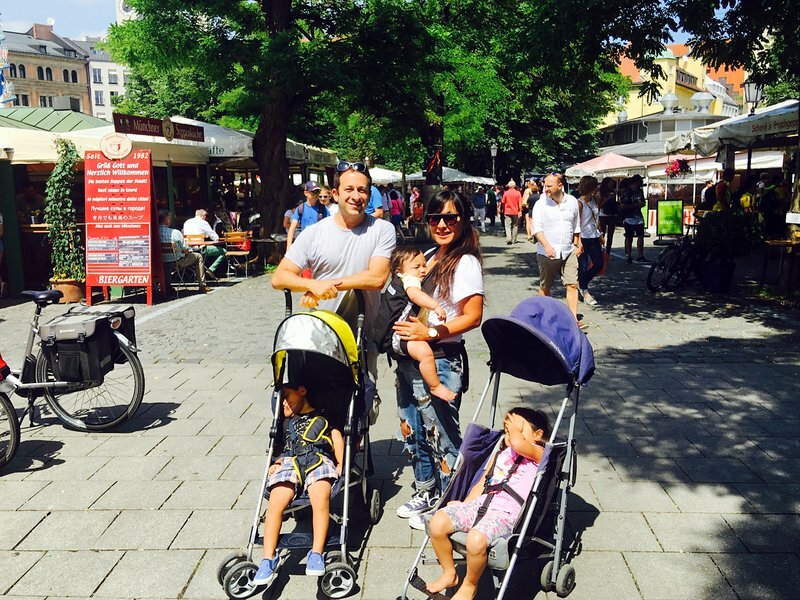 We also quickly found that it was quite expensive, and there were clearly more tourists around than Münchners. 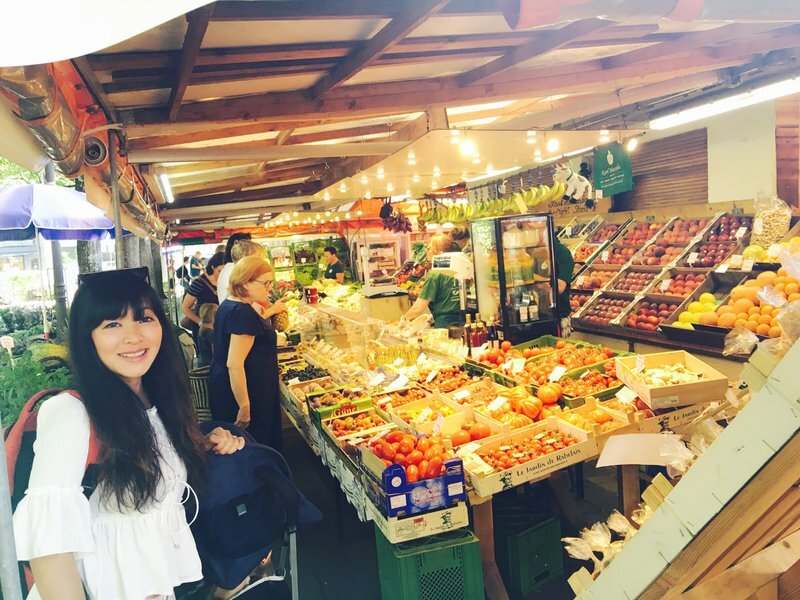 We bought a good amount of fruit for the apartment and ate in the small beer garden, where the entertainment was provided by the waiters angrily shooing away people who tried to sit at their tables with food purchased from other vendors. We spent another couple of hours walking around the central Marienplatz area, home to the impressive Gothic Neues Rathaus (new town hall) and the formidable Frauenkirche. We toughed it out as long as we could but by seven we could barely keep our eyes open and headed back to the apartment. On the way back, we were overtaken by a seemly endless series of police cars and ambulances with lights and sirens flashing but I barely gave it any thought except to wonder if there had been some kind of major auto accident. We ate some of the fruit we had bought and crashed. I woke in the middle of the night and reached for my phone to check the time. 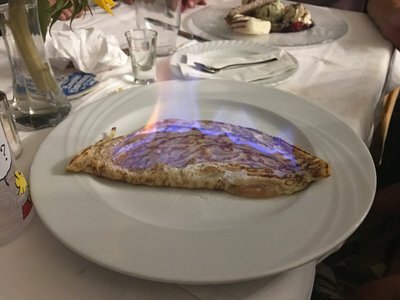 It was three in the morning. I opened Facebook to see if Mei Ling had posted any pictures and saw that she had, and then a lot of messages under her pictures asking her if she was safe. What? Next stop was CNN, where I learned that multiple people had been killed in what appeared to be a terrorist attack in Munich and that more terrorists were reportedly roaming the streets. Everyone in the city was being advised to shelter indoors. I processed this for a few minutes and realized that there was nothing we could do that night to make ourselves any safer. If there was still some kind of active terrorist situation going on in the morning, I'd have to consider packing everybody up and driving to another city. I made a quick post to let everyone know we were OK and went back to sleep. By the morning it was already apparent that what had taken place was actually an American-style mass murder by a disgruntled teenager rather than a terrorist attack, and there was no longer any active threat. No less horrific for the families of the children who had been killed and injured, but a relief for Munich and for us. We proceeded with our planned walking tour of Munich as though nothing had happened. 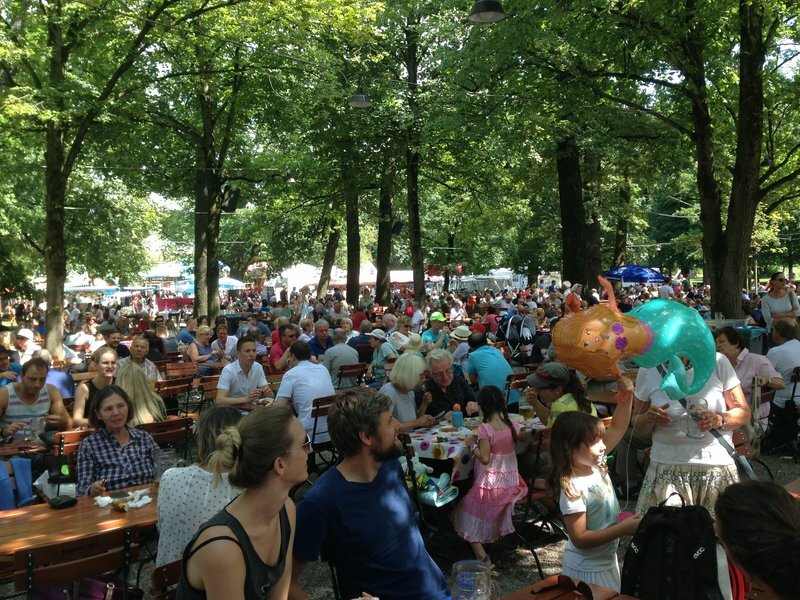 Our first stop was the Elisabethmarkt in the bohemian neighborhood of Schwabing, north of the center. This was a quieter market than Viktualienmarkt with a more local vibe, but still with an excellent selection of produce and numerous small artisanal food shops. Lunch next to the market was the classic combination of weisswurst, currywurst, and draft beer. From there we walked down Leopoldstrasse, the main drag of Schwabing, to the center. We encountered what appeared to be some kind of street festival in the process of being either set up or disassembled. I asked some of the folks involved if there would be a festival that weekend and they shook their heads. We learned that the previous night's events had resulted in the abrupt cancellation of all ongoing festivals in the city for the weekend. I felt somewhat guilty about being disappointed by this, considering several children had lost their lives. 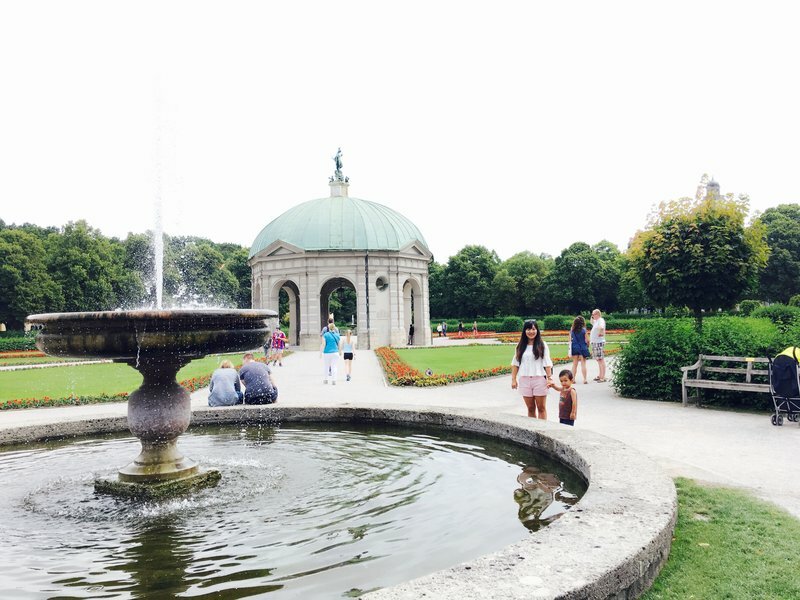 After walking around the cluster of palaces and museums in the center known as the Residenz, we walked through the beautiful green Hofgarten to the southern entrance of the Englischgarten. We watched the surfers try to tame the waves at the famous Eisbachwelle for a while, and then headed north. We soon encountered the nudist section of the park, much to Mei Ling's amusement. 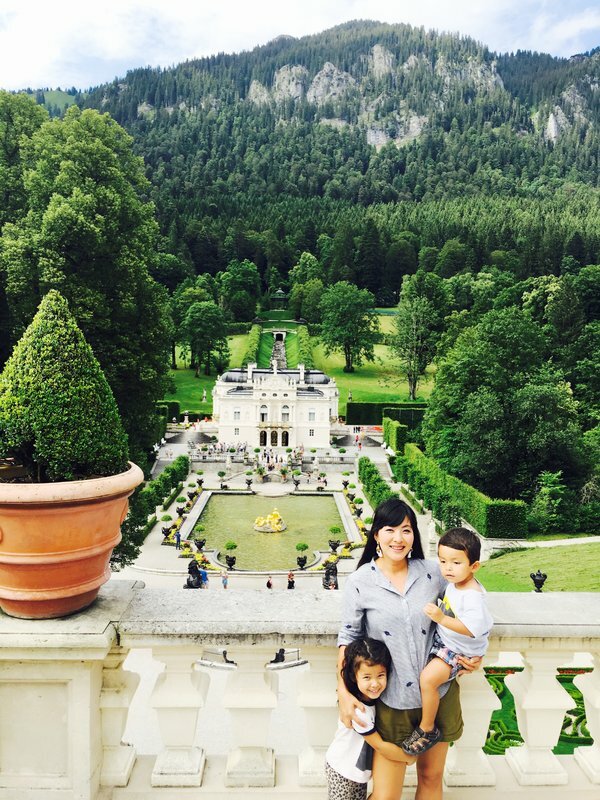 I suggested the whole family strip down and pose for a photograph from behind, but Mei Ling vetoed that idea. 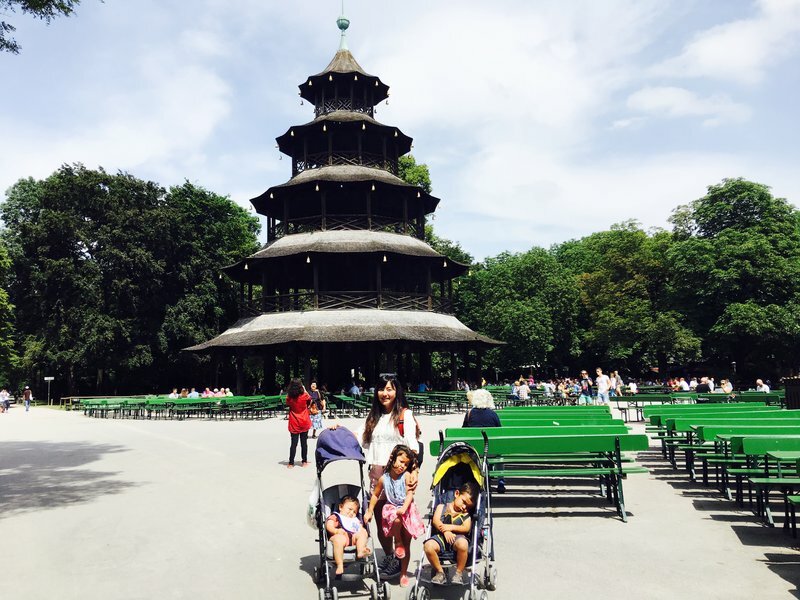 We stopped at the Chinese tower beer garden for more beer and sausages, along with delicious grilled vegetables. It was good to see that there were hundreds of people enjoying the weekend in the beer garden despite the previous night's tragedy. 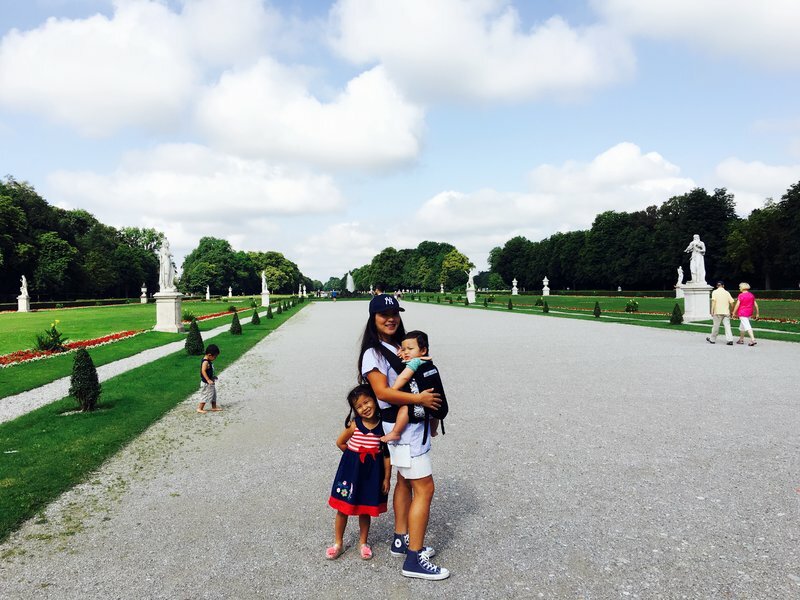 On our last full day in Munich, we walked around the gardens of the Nymphenburg Palace for a couple of hours. 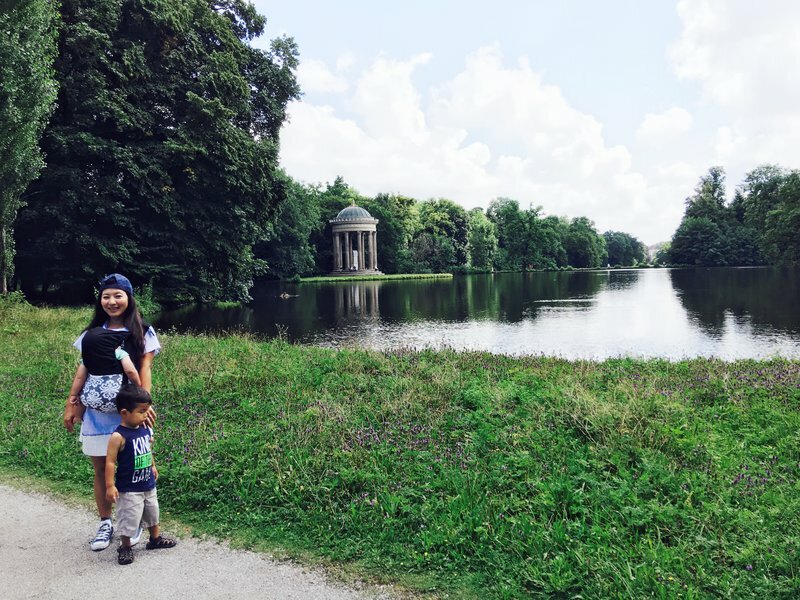 The grounds of the 17th century Baroque palace are very expansive and contain a complicated network of canals and beautiful lakes. 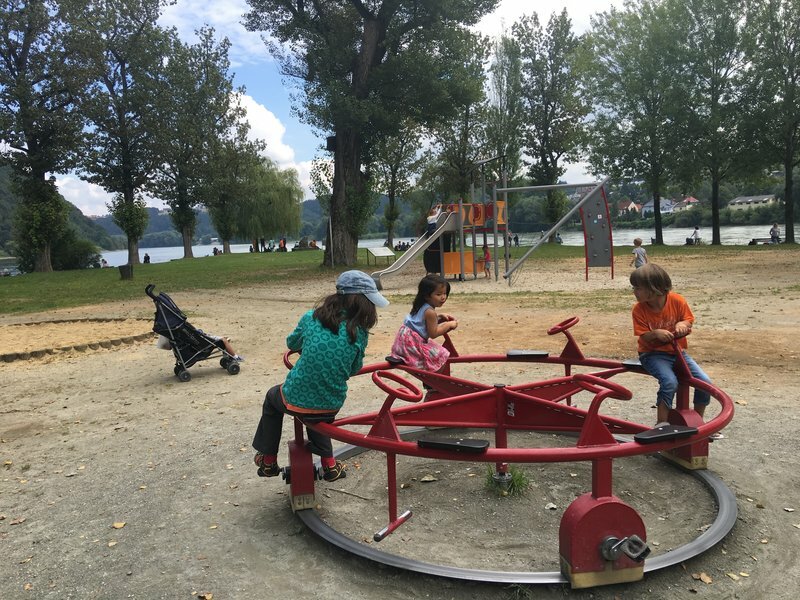 We spent the rest of the day at the nearby Hirschgarten, which had the best beer garden yet and tons of stuff for the kids to do. 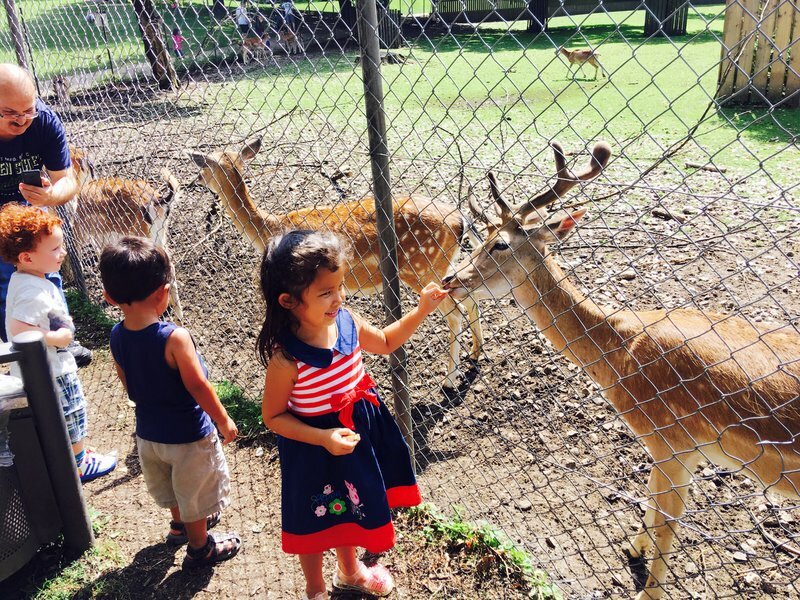 There was a splash park, playgrounds, a deer feeding station, and a small fair with plenty of rides. 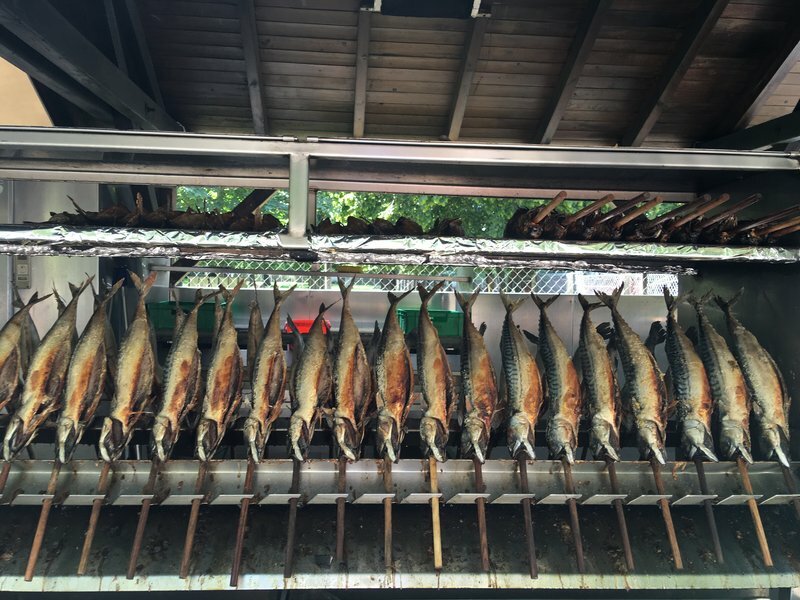 The highlight of the beer garden was Steckerlfisch, delicious and savory mackerel that were barbecued on a spit. We ate lunch, entertained the kids for a few hours, and then ate dinner at the same spot before heading home for another early night. After our epic road trip around the Adriatic in 2014, I started daydreaming about other routes that would take us through every part of Europe I'd ever wanted to visit. 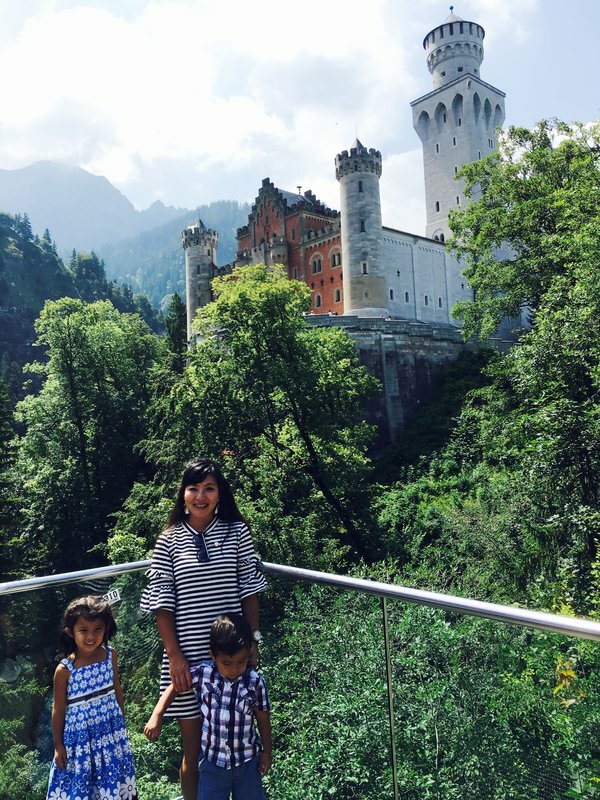 I settled on a time frame of four to five weeks, since it would be long enough to make the hassle and expense of flying and renting the car worthwhile yet not long enough to make us weary of traveling and managing the kids. 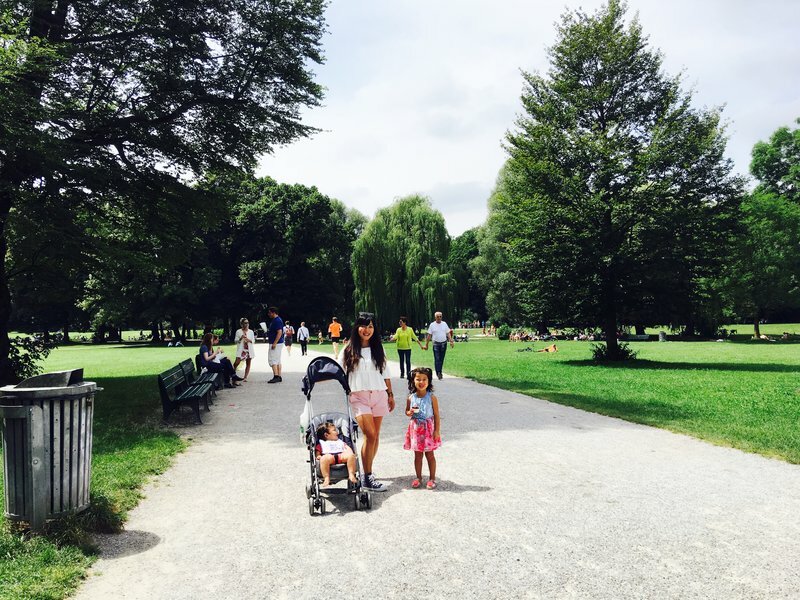 This summer we were able to knock out two of my highest priority routes. 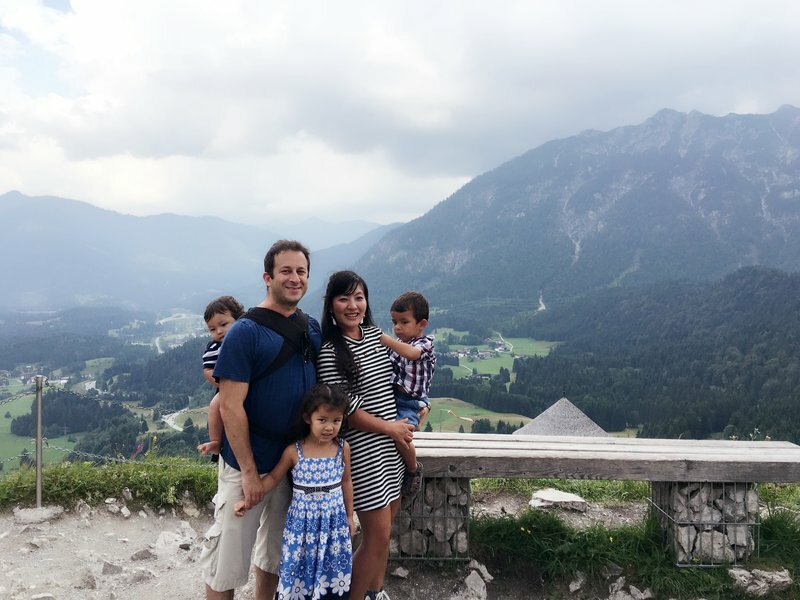 I've already blogged about our Catalunya and Southern France trip, and this is the story of our month-long round trip that began and ended in Munich and took us to most of the great cities of Central Europe. 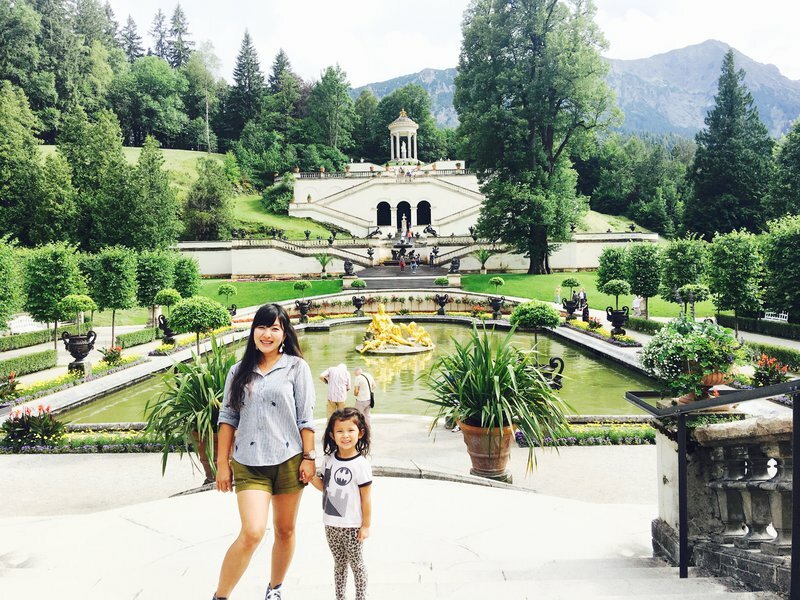 Originally I had planned an eight country trip which would have begun in Frankfurt and included Zurich and Liechtenstein, but we would have needed at least another week to avoid skimping on the rest of the itinerary and we didn't want Cleo to miss her first week of Pre-K. I sliced the westernmost part of our circle away and moved our anchor point to Munich. We'll see the Rhine and Lake Constance on another road trip. That left us with Germany, Austria, Hungary, Slovakia, Poland, and Czech for this trip which ended up feeling slightly rushed but overall a great experience. 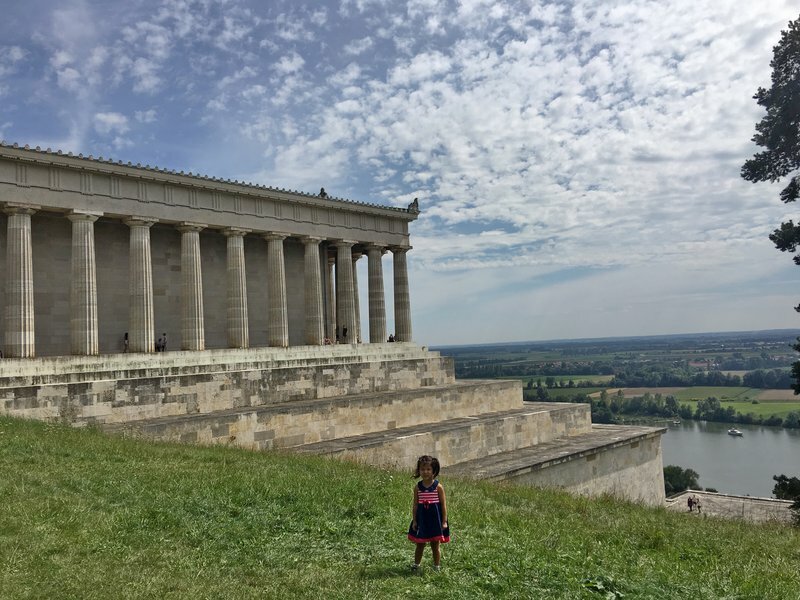 Of course, every trip we take seems to spawn two or three new itineraries in my mind so we're no closer to completing our mission of seeing everything we ever wanted to in Europe. My highest priority trip at the moment will begin in Milan and take us through Tuscany, Corsica and Sardinia before concluding in Rome. I hope to get that one done in 2018 (in odd years we go to Asia). I have at least one other trip planned for Italy as well: Rome through Naples and the Amalfi coast to Calabria and Sicily and then back to Rome. Some other ideas in the pipeline are Barcelona to Bordeaux to Galicia to Northern Portugal and back to Barcelona; an Amsterdam round trip that would take us through Belgium to Luxembourg, Alsace, Switzerland and Western Germany; Berlin to Riga and back via Poland and Lithuania; and a couple of extensive trips through the Balkans and Greece and through Scandinavia that I haven't yet given much thought to. By the time we're done with Europe, the only European country I don't expect to have visited is Moldova. But then again, I never planned to go to Poland and now I can't wait to go back. I think I'll experiment with being a little more succinct on this blog. 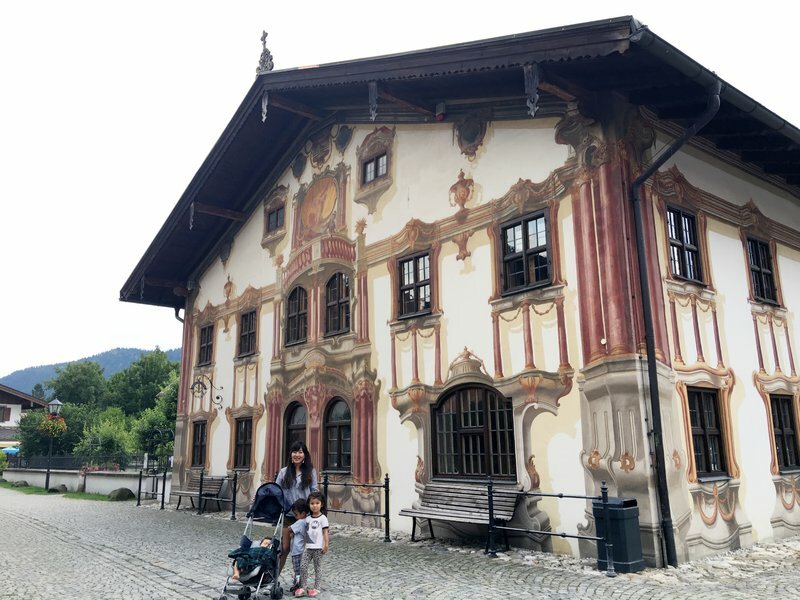 I wrote up the first two European trips in exhaustive detail with a lot of pictures because I approached the blog as a living photo album that we could go back to to relive the memories of our trip. I like the idea of the kids reading it when they're older, having no real memories of the trip, and seeing their younger selves having fun in those forgotten places. Perhaps it will keep the fires of travel stoked in them when they've gone off to school and moved on from us. 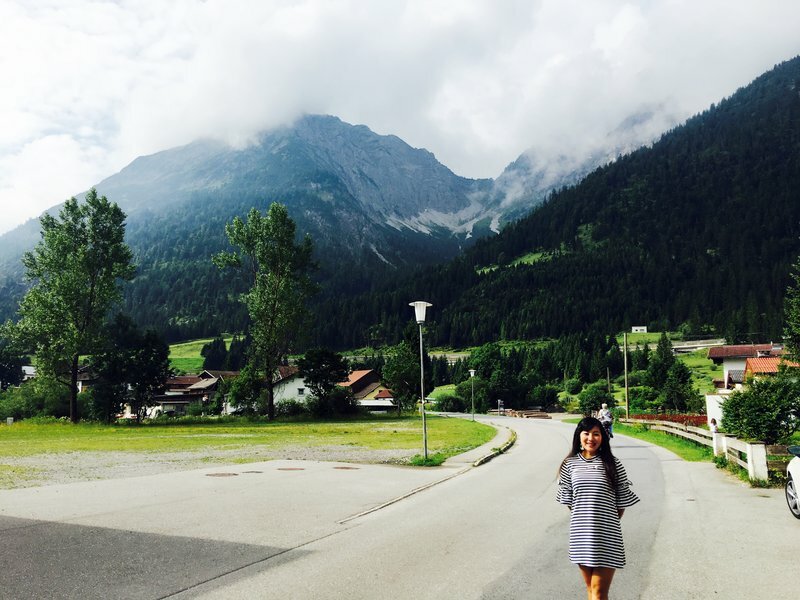 I went through a long travel drought in college and medical school simply because I had no idea how much fun it could be to travel on my own or with friends, then rediscovered it in my mid 20's. I've always regretted not taking a semester away in college. However, the downside of the long format is that it is very time-consuming to write, and it's not really accessible to someone who finds the blog because they're looking for a quick overview of an interesting part of the world. 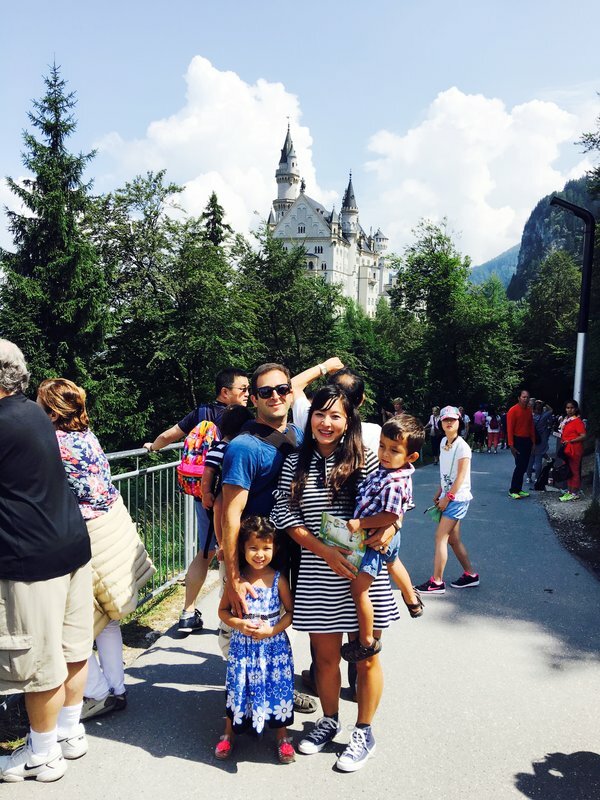 We've gone on a lot of trips before and since the Adriatic road trip that I didn't blog simply because I couldn't face the time commitment. I'll see if I can write this trip up in about half the pages and about half the time and decide if I like it as much as the other blogs I wrote. If so, I might blog some of our older trips including the USA road trips. It would be interesting to know what other readers think as well. I know some people come here and read the blog but never comment or provide feedback, so it's kind of like writing in a vacuum regarding what the general public wants to see.